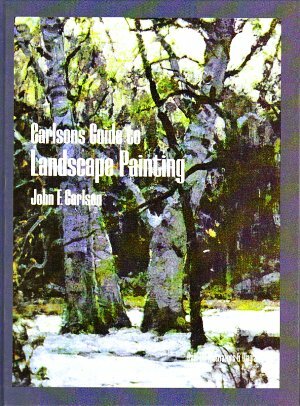 Carlson's Guide to Landscape Painting was first written in 1929, revised and reprinted in 1958 by John E. Carlson, then reprinted again in 1973, ISBN 0-486-22927-0. It has become a classic, while it's currently out of print it's still so much in demand that they may reprint it again. This hardcover book is a bit unusual compared to modern pastel and oil instruction books because all the illustrations are in black and white. It sometimes runs high at used bookstores or Amazon, but it's well worth the price for the incredible amount of information. It's useful to the serious, expert landscape painter as well as the beginner -- it's so well written that a beginner could get started on the right foot and avoid many common problems in composing landscapes. One thing the black and white illustrations do is emphasize the importance of values and value masses in composition. Sometimes it's too easy to get distracted by color, so all the illustrations here make the point of Carlson's lessons clearly. There is an excellent chapter on color and aerial perspective that goes into many concepts and techniques of mastering it that I hadn't run into anywhere else. The same could be said for the chapter on linear perspective. Most books have some mention of it and show the receding telephone poles by a highway diagram to illustrate it. Carlson goes way beyond that to explain, diagram and help the artist comprehend linear perspective on a twisted, curving, up and down country road that zigzags through hills. I've seen many good landscapes including a lot of my own put zigzag paths into the painting for visual interest -- and lay them out on flat ground so that the perspective is easier to calculate or approximate. Carlson freed me from that flat ground and now I can look at the way an area looks from the top of a hill or the bottom of a hill and calculate linear perspective for it accurately even though the road bends. Unique diagrams make all these new methods and processes a lot more understandable. I particularly appreciate all the clean, well-drafted diagrams that accompany the black and white photos of Carlson's own landscape paintings. He was a prominent painter whose works fill numerous museums, an important painter who deserved this level of attention for the beauty and power of his landscapes. This book was recommended to me first by Charlene Herczfeld, my soft pastels teacher, but seconded by every serious pastelist I know, many of them also oil pastelists. It's an essential if you want to do landscapes and can help with other subjects like still lifes or figures too with the sheer amount of information. Carlson also tackles subjects like painting from memory -- again, something that I haven't run into much about in most other art instruction references. His comments on painting in general are inspiring and engaging, his prose is clear and readable. Overall, the down side is that this book is a slow read. I would suggest purchasing it and then plan to take a long time to finish it. Read a chapter, digest what's in that chapter, do some sketching to test his diagrams and ideas -- Carlson is very good for sharpening observation -- then relax and ruminate for a while before proceeding. Most of the time I read new art books in one mad gulp and then think about it for a few days or weeks before trying out the new ideas in paintings. This one each chapter has been like that process. Topics I thought I was already familiar with have been expanded and kicked to whole new levels. Blind spots I had like always putting those zigzag paths on a flat plain are breaking down. Carlson's Guide to Landscape Painting may not be a quick read or a casual read, but I'm glad my copy is hardback. I know that I'll be referring to it again and again over the years to figure out how to solve perspective or color problems, how to sort out a scene, how to push a background to supporting role or create a powerful dramatic scene to put action in. There's only one other author whose art books have been like that -- Jack Hamm's books take that kind of slow approach with plenty of rereading and testing. This book will push your landscape art to a new level. I have seen paintings in galleries that could've benefited from some of what he talks about, where it's clear the artist didn't understand something this volume makes usable and understandable. It's a thrill to figure out why things work the way they do and depart from literal copying of whatever's in front of me to composing a landscape well. I find that with Carlson's Guide to Landscape Painting, I'm able to create landscapes from memory and imagination in ways I never could before.